← Swap 2 variables without using temporary variable! 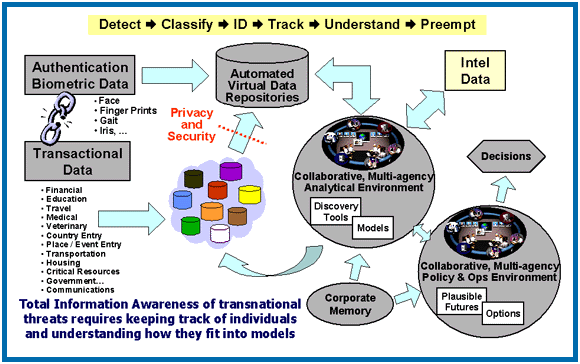 Total Information Awareness (TIA), a project of the Defense Department’s Defense Advanced Research Projects Agency (DARPA), aims to build a centralized database containing private transactional data on all Americans, including “records on credit-card purchases, plane flights, e-mails, websites, and housing.” In the tradition of the Bush Administration’s policy of preemptive action, TIA’s goal is to create electronic tools to “better detect, classify, and identify potential foreign terrorists…to increase the probability that authorized agencies of the United States can preempt adverse actions.” The government establishes baseline patterns identifying what they see as suspicious behavior, such as buying one-way plane tickets or drastic changes in spending habits, and then conducts pattern-based electronic searches of huge amounts of information to find matches for their trends. The personal information is “mined” from private sector databases as well as government databases. In September 2003, Congress gave into public objection by denying funding to TIA or any successor program. Nevertheless, the Pentagon’s Technology and Privacy Advisory Committee (TAPAC) reported that TIA-like activities could be continued to be pursued outside the public’s view. Since that time, it has been reported that aspects of TIA went underground and had now become a fast-growing data-mining system billed as a tool for hunting terrorists and is being used in hacker and domestic criminal investigations, containing tens of thousands of records from private corporate databases, including car-rental companies, large hotel chains and at least one national department store. 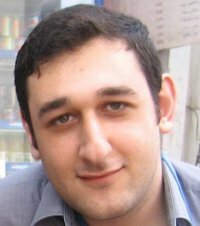 Although the investment in TIA was considerably huge and lots of efforts were put together in the data collection and mining process, the alleged ability of data-miners to discover hidden “patterns” and “trends” among disparate data-sets was naïve and lacked precision because so little is known about what patterns indicate terrorist activity; as a result, they are likely to generate huge numbers of false leads. Besides, Privacy concerns about mined or analyzed personal data also include concerns about the quality and accuracy of the mined data; the use of the data for other than the original purpose for which the data were collected without the consent of the individual; the protection of the data against unauthorized access, modification, or disclosure; and the right of individuals to know about the collection of personal information, how to access that information, and how to request a correction of inaccurate information. All these led to a failure in developing an efficient counter-terrorism prediction system and caused the complete termination of the TIA project.